When you learn how to make risotto in a rice cooker you'll never go back to the labor-intensive stovetop method that requires constant stirring while you add portions of hot broth. Made in the rice cooker, risotto is easy and largely a hands-off affair. To make risotto in a rice cooker, you'll need measuring cups, a liquid measuring cup, cheese grater, wooden spoon or silicone spatula, and, of course, a rice cooker. You can use any risotto recipe you like, including a cheesy vegetarian risotto, pancetta risotto, mushroom risotto, and curried risotto. You will find that most recipes include a fat, such as oil or butter, as well as aromatics, like onions, ​shallot, leeks, and garlic. Wine is another ubiquitous ingredient, as is a liquid such as chicken broth. But the most important ingredient is the rice, and this must be a short-grained rice like arborio rice. 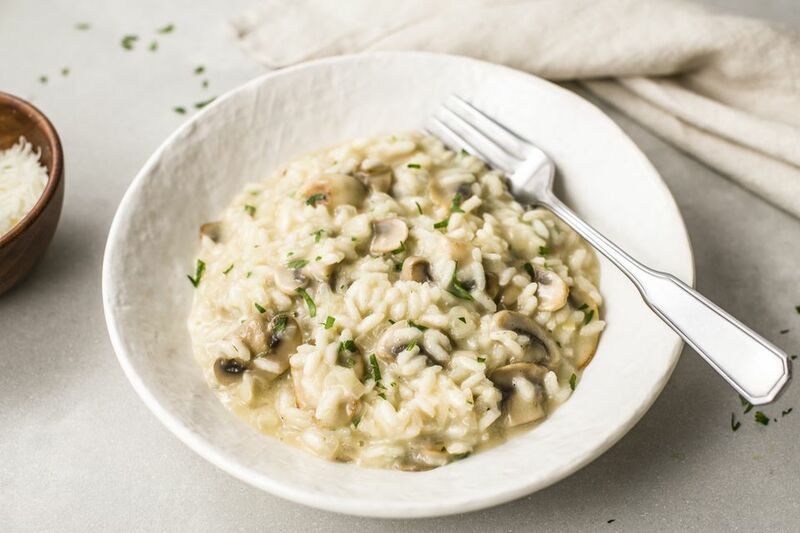 Compared to other rice, arborio retains more of the natural starch that is released while it cooks, creating a creamy texture—an essential characteristic of risotto. Many recipes will also include a vegetable or two and may feature protein as well, such as chicken and shrimp. Risotto also commonly calls for a grated cheese like Parmesan. A risotto recipe begins with sauteeing the aromatics in olive oil or butter. To do this in a rice cooker, set it to "Quick Cook" or "Regular" and let the surface of the rice cooker pot heat up for 1 to 2 minutes. Add the butter or olive oil to the pot and use a wooden spoon or a silicone spatula to spread it across the surface of the pot. When the oil is heated, add the aromatics and coat with the oil. Sauté, stirring occasionally, until softened and translucent. This should take about 4 to 5 minutes. Adding the wine is the next step. Pour in the white wine or vermouth and stir to combine. Cook for a few minutes to allow the alcohol to evaporate and the wine to heat up and reduce a little. Now it is time to add the rice to the pot. Stir to coat the grains of rice completely with the ingredients. Sauté, stirring frequently, until the rice starts to absorb the wine. The rice will eventually become translucent around the edges, with a small white dot remaining. This means it's time to add the stock. Before you add the stock, add the vegetables, if you're using any, and sauté them for a minute or two, stirring occasionally. Leafy vegetables, such as arugula or watercress, should not be added until the end of the recipe. But harder vegetables like asparagus or squash need time to simmer and cook through. This is where the traditional method of making risotto gets a bit laborious, as you need to slowly add the hot stock in small portions, stirring constantly until each portion is absorbed. But when using a rice cooker, you simply pour in the stock or broth all at once and stir to combine it with the rice. Now you're at the point where you let the machine do the work. Close the lid of the rice cooker. If your cooker has a porridge setting, set it to that. If it is an on-off cooker, or only has a "Regular" setting, then use that setting. Either way, you should set a timer for 20 minutes. After 10 minutes, check on the rice and give it a stir to recombine the ingredients. When the timer goes off, check on the risotto. The rice should be tender, but still have a little "bite" to it, what the Italians refer to as al dente. And there should be enough liquid remaining to make it just slightly soupy. If there is still a lot of liquid remaining, and the rice is still hard in the middle, cook it a little longer. If your recipe includes it, sprinkle in the cheese, season to taste with salt and pepper, and add up to another tablespoon of butter if desired. Give it a stir to combine everything. If you're using fresh herbs or chopped greens, add them now, stirring to combine and wilt. You can close the lid and let the risotto sit for a minute to wilt the greens, but don't let them cook too long since you want them to have a bright color. Divide the risotto between shallow pasta bowls and sprinkle with grated Parmesan cheese and some fresh chopped herbs such as parsley or basil, if desired. Enjoy!